Leona “Beth” (Barney) Martinsen passed away on June 24, 2018. It was a quiet Sunday afternoon and she left us peacefully and with faith. She knew where she was going. 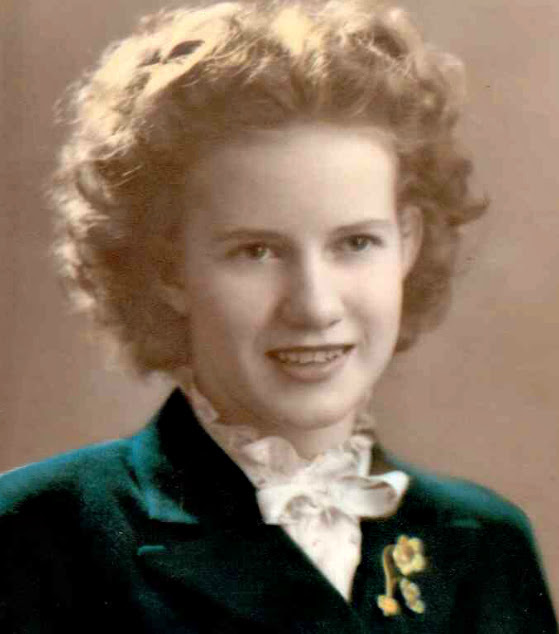 Beth was born to Benjamin and Leona Mose Barney on April 28, 1926 in Lewisville, Idaho. She grew up working with her brothers on their family farm and remembers the bitter cold of riding a horse to school in the Idaho winters; her fingers numb on the saddle horn. But oh, how she loved the summers! At the age of five, Beth decided to attend the LDS church and would walk herself to Primary each week. She loved church and had a feeling this was the right thing to do. This determined faith would guide many choices she made throughout her life. 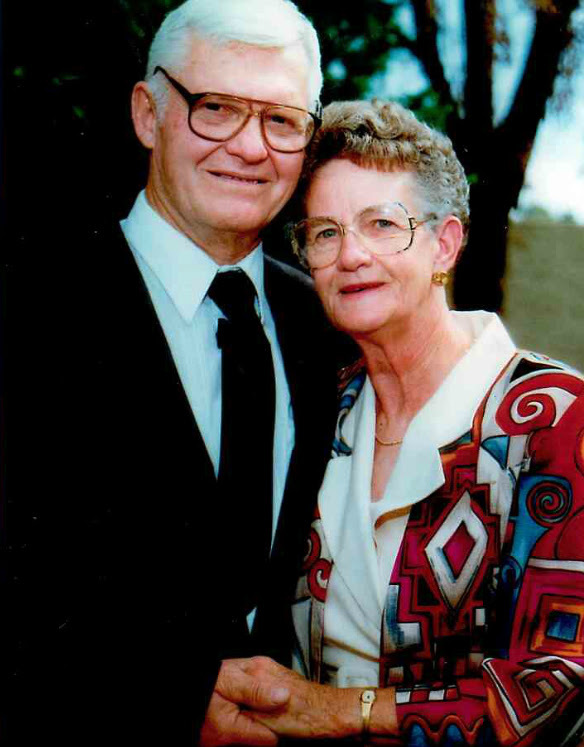 Beth fell in love with Don W Martinsen and on October 10, 1945 in Dillon, Montana they were married. Don was on military leave, only having a few precious days before he had to report back to service. The couple decided to make the drive to Montana to marry, since Idaho required a three-day waiting period for a marriage license and Montana had no such requirements. Both moms and Aunt Beula accompanied them so they could attend this happy ceremony. In their excitement to be married, Don and Beth didn’t anticipate the awkward, several-hour-drive back to Idaho with a car full of moms and Aunt Beula and they, now newlyweds, wanting to be alone. Beth, with a chuckle, said it was a quiet, tense drive. The same faith that guided her down an Idaho path to Primary lead both Don and Beth to be sealed for time and all eternity on February 13, 1957 in the Idaho Falls temple. They raised their six children with this same faith—Zay Don (Beth) Martinsen, Rick Lee (Julie Heap, Amy) Martinsen, Peggy Beth Barnett, Jerry Ben (Mindy) Martinsen, J Norman (Debbie) Martinsen, and Treva Leona (Pat) Hughes. They were blessed with twenty-six grandchildren, over fifty great-grandchildren and, to Beth’s delight, a few great-great-grandchildren. Don and Beth showed their posterity what it was to be in love and to have a testimony of the restored gospel of Jesus Christ. Their service included family history and genealogy work, temple work, and many church callings. They thrived doing this service together. Beth’s faith saw her through the loss of her beloved Don, helping her keep an eye focused on the eternities. When her body became too frail to be physically useful, she did the one thing she could do—share her testimony with those around her. True to her nature, she did this with a peace that drew others close. You left Beth’s bedside feeling lifted and loved. So, it was no surprise that she would leave us on a quiet Sunday afternoon, as peacefully as a young girl walking an Idaho path to Primary, because she knew where she was going and who would be waiting there for her. Services for Beth will be held at the LDS chapel on the N/E corner of Lehi and Horne, 830 East Lehi Road, Mesa, AZ, 85203 on Friday, July 6, 2018 at 10:30am, with a viewing and visitation beginning at 9:30am. Following the services, the graveside will be held at the City of Mesa Cemetery. Sorry for your loss. She had a long life. But I’m sure she happy to meet up again with her husband. My sympathy to the family on the loss of your loved one. Peggy and Family – I am so very sorry for your loss. You are all in my thoughts and prayers. Prayers are with you and your family. What an amazing legacy. Such a wonderful, kind lady. I am so sorry to hear of your loss. She was very special, and I know my brother Chris loved her. My prayers are with you all. God bless.